A conversation in Zagreb led me to this picture. 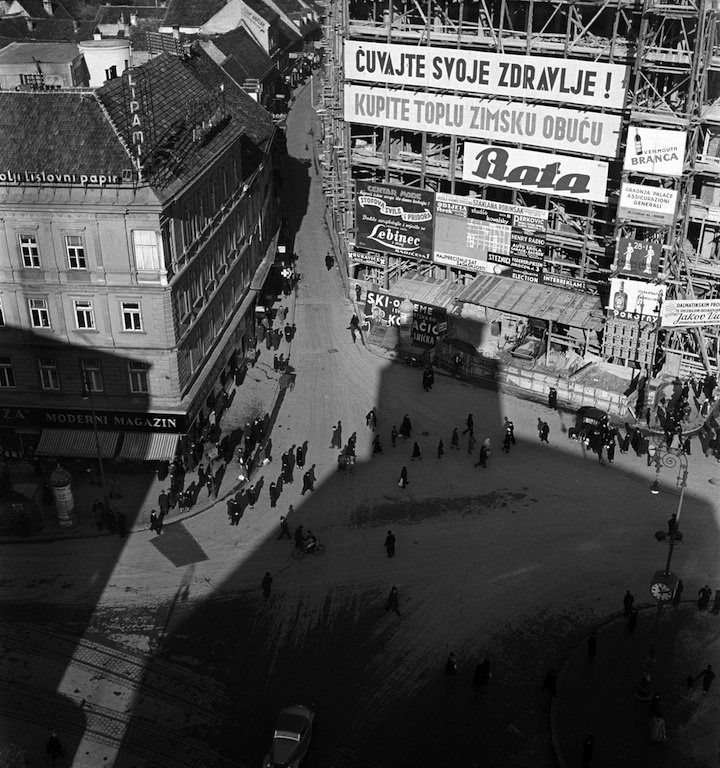 A Croatian friend mentioned what an important figure Tošo Dabac (1907-70) was in the history of the country’s photography, and then we discussed the frequent presence of text in photographs of street scenes, a theme of mutual interest. Sometimes these letterforms and words are the obvious focus of the photographer’s attention, but equally often the picture has another ostensible subject—people, buildings, cars—and the text just happens to be caught in the frame by chance, like a witness at the scene. 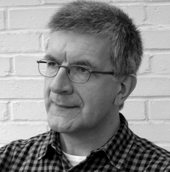 What stories can it tell? The following day, searching for books about Dabac, I found a catalogue for a recent exhibition titled “Text and the City” (Tekst i grad) organized by the Museum of Contemporary Art in Zagreb. 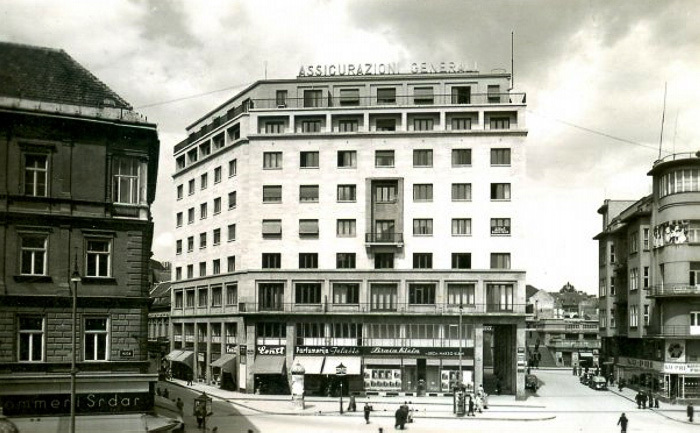 The first photograph in the book is an emblematic early example of the genre: Dabac’s picture of the Assicurazioni Generali insurance building, which he photographed in 1937 from a position high above, a favored modernist viewpoint, though the description in the photograph’s title is a little misleading. The building, on the corner of Trg bana Josipa Jelačića, the city’s central square, was then under construction on the site formerly occupied by the Pongratz palace, and its façade is entirely concealed by scaffolding that forms a temporary display space for advertising. The top two lines read, “Keep your health! Buy warm winter shoes—Bata,” and a smaller ad promotes Branca vermouth. For the catalogue’s author, Ofra Amihay, Dabac’s textual photographs, a recurrent subject in the 1930s and later, are a “poem of undivided love” to Zagreb, and a deep influence on Croatian urban photography and “its sensitivity to text in particular.” The focus on text in Dabac’s picture is certainly not accidental. Positioned at the top where the light makes them sharp and clear, the rows of words are the most commanding aspect of the scene, and the enveloping shadow of the building where Dabac has stationed himself points directly at them. If we pay any attention to the building to the left, it’s because it also carries a few words at roof level and on the shopfront below. These urban scripts are everywhere, and Dabac records a city in transition, embracing the possibilities and excitements of modernity embodied in the promises of commercial language. The receivers of these messages, reduced in the aerial image to tiny, indistinguishable figures, go about their business far below, while the advertising dominates this corner of the city’s social center. In Amihay’s pointed term, this public text amounts to the “textual unconscious”—the real meaning—of the picture.